On the 15th of every month he makes a two day trip to Leyawiin. He departs from his house at 9am and then exits the city. 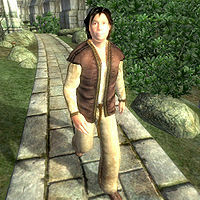 After crossing the Talos Bridge, he heads south on the Red Ring Road and follows it until he reaches Pell's Gate, then heads south on the Green Road. He will keep walking on this road all the way to Leyawiin, on the way passing the city of Bravil. This long trip takes him twenty-four hours and he usually reaches his destination just before 10am on the following day. Upon arrival, Hastrel will head over to The Three Sisters' Inn and book himself a room. He will spend one day in Leyawiin, mainly socializing, before he departs for the Imperial City on the 17th at 9am. He will take the same route back and if he is untroubled on the road home, he will arrive back at his Imperial City home at 10am the next day. During the Light the Dragonfires quest, Hastrel like most other Imperial City citizens is confined to his house. On his monthly trip to Leyawiin, like most traveling NPCs he may be attacked and killed.